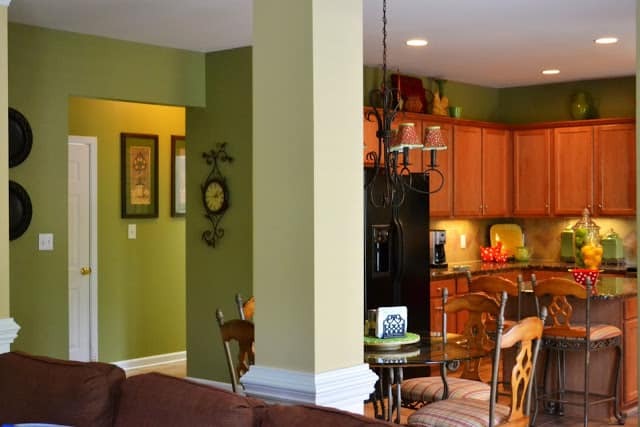 If you saw the tour of my family room, you could see that it opens right up to the kitchen. I really like the size of this kitchen. There’s lots of counterspace to work on. And trust me, sometimes I have stuff spread all over the place. 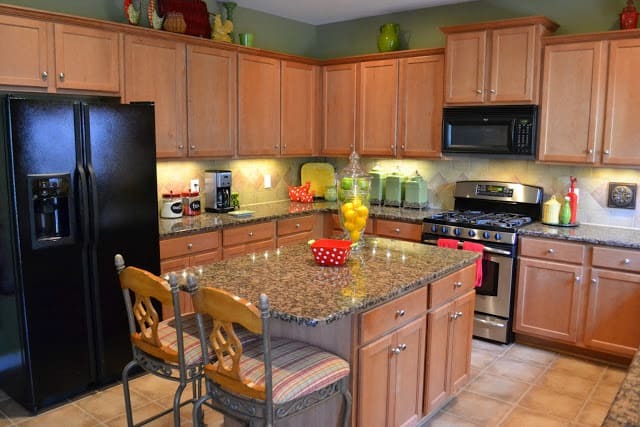 What I don’t particularly like about this kitchen are the finishes. I’ve mentioned a few times before that this is a spec house, so it is what it is. And since this isn’t my forever house, I’m not willing to spend the thousands that it would take to change the granite counters, tile floors, backsplash, refinish the cabinets and replace the appliances. So…I’ve tried to not only learn to live with it, but to embrace it as best I can. 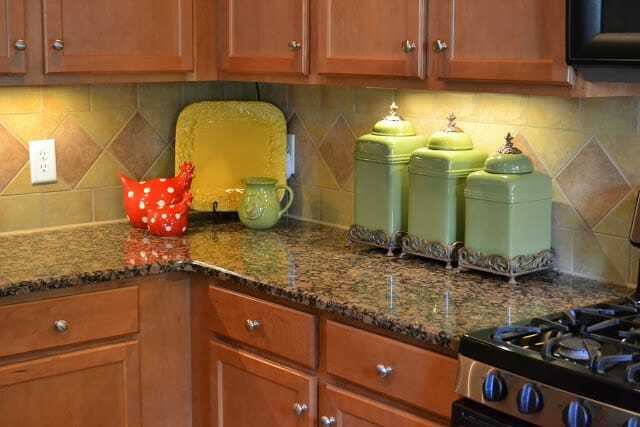 There are very slight green and red undertones in the backsplash tiles, hence the wall color (Sherwin Williams, Lemon Verbena, SW7726) and fabric selections. 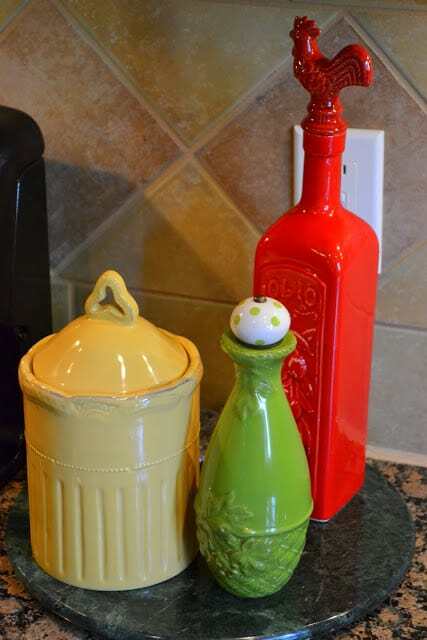 …and by placing large canisters and a vignette on the other side. I think that the use of colorful accessories helps to keep your eye from focusing on the granite that I’m not very fond of. There are large apothecary jars on the island. Did you know that Walmart is great place to buy faux fruit? Very realistic and affordable. 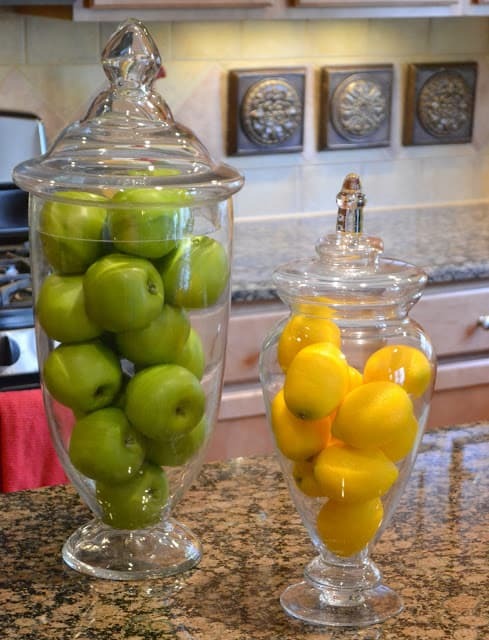 I’ve had several people ask me if the apples and lemons are real. I love this little lamp. It has followed me to three different houses. I had it custom made and the rooster isn’t attached, so I usually change out what’s displayed on the base during the different seasons. 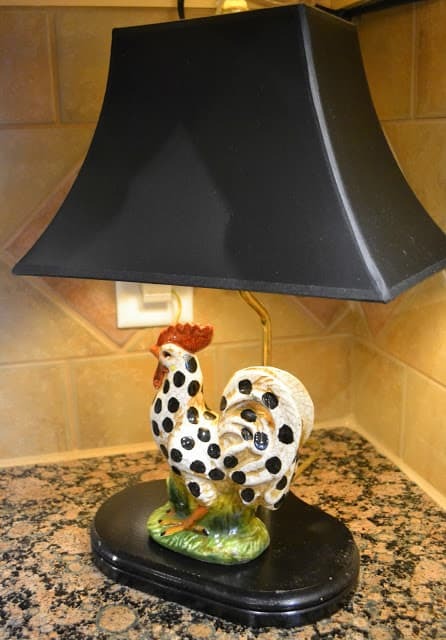 Yes, like so many of you, I have roosters in my kitchen. I love ’em! These containers sit on a marble cheese board to the right of my stove. The yellow canister contains kosher salt, which I use when I’m cooking. The other two are empty, but we’ll pretend that the red bottle contains olive oil and the little green one contains balsamic vinegar. The green and white polka dot topper isn’t a topper at all. It’s a cabinet knob that I picked up at HobLob. I found the red rooster stopper at Pier I. 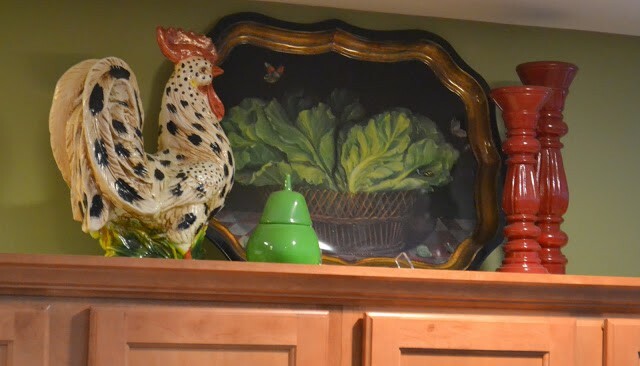 Even more roosters reside in this little vignette in the corner. I even have them on the top of my cabinets. I found this proud guy on ebay a few years ago. I found these cute little guys on the left at HomeGoods in Wilmington, NC. I loved them so much that I couldn’t decide on just one, so I bought them both! I love you all so much that I got up on a ladder so I could be at eye level to snap these photos of the tops of the cabinets. As a result, you can see the blocks and plate stands that some of the items are displayed on. They aren’t visible from the floor and they keep things from disappearing back behind the crown moulding on the cabinets. 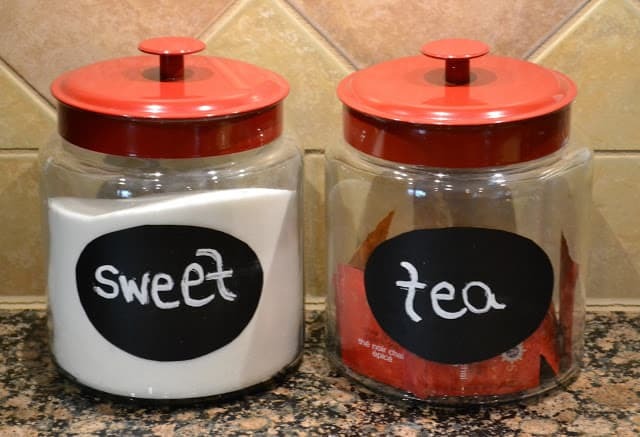 These glass canisters sit to the right of my refrigerator along with the coffee pot. I found them at KMart a couple of years ago. One contains sugar and the other contains chai tea bags. I used a chalk pen to write on labels that I cut out of black vinyl. the refrigerator sits against. The white door that you can see leads out to the garage. 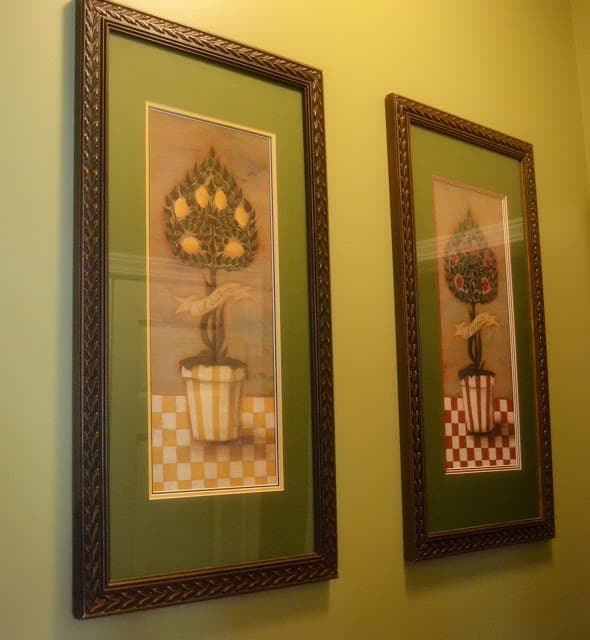 These two topiary prints are hanging on the wall leading to the laundry room and food pantry. I’ve had these for years too. Because of the narrow hallway in this area, I had to step out into the garage to get a picture of where the food pantry is located. I couldn’t get far enough away from it to give a view of the inside, but just picture deep wire shelves full of mostly organized stuff. This is looking directly into the kitchen from the garage. 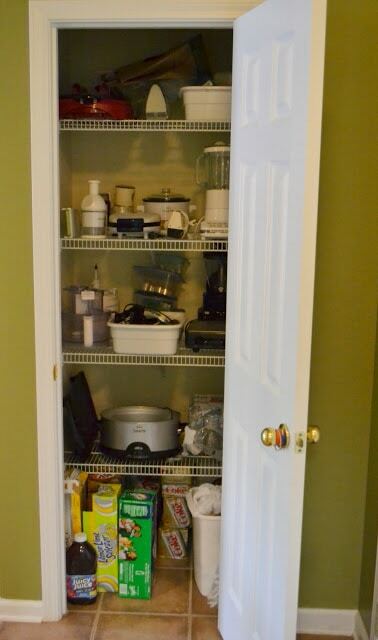 The door to the second pantry sits on the wall behind the open garage door. It was originally a coat closet, but we have another one in the family room area, so Pookie converted it into an appliance pantry for me. Isn’t it amazing how much stuff you accumulate over the years??? 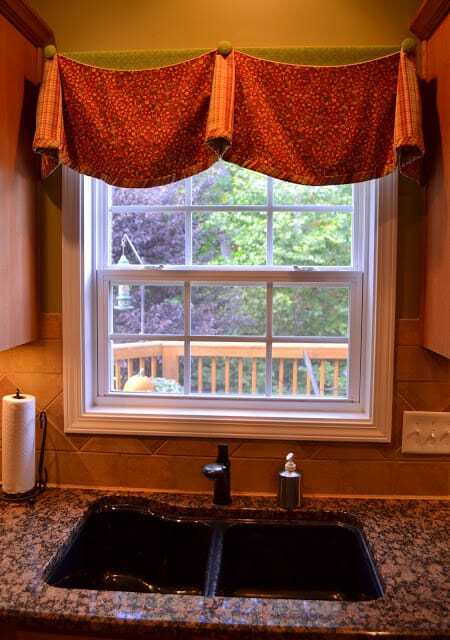 I made this window treatment that hangs above the kitchen sink. It is mounted on 1x4x3 boards. The decorative buttons are covered with the same fabric that the boards are covered with. The inside of the “bells” and the banding across the bottom are made out of a cute little coordinating plaid. 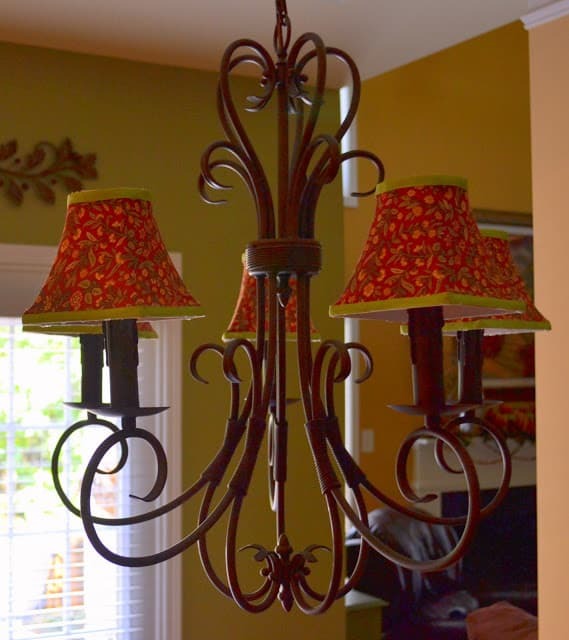 The light fixture above the table isn’t the one that was originally in the house. 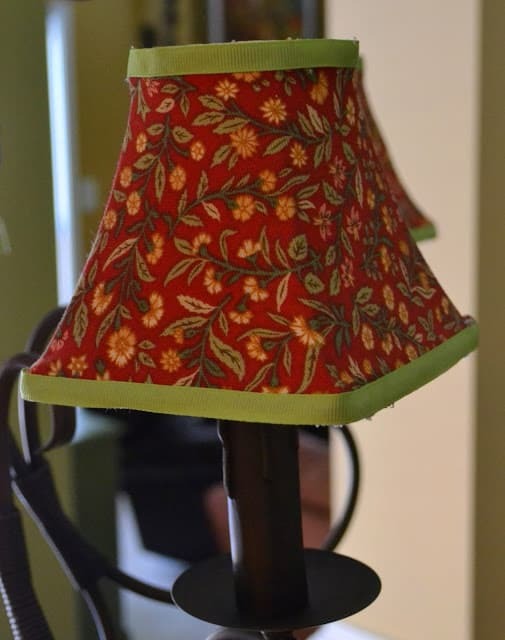 I found this one for a very good price and searched out some shades that I though were a cute shape and covered them with the same fabric that the window treatment is made from. I trimmed them out with apple green grosgrain ribbon. And I recovered the chair and barstool cushions with same plaid that was used on the window treatment. I hope you enjoyed this tour of my kitchen. So many of the pictures have a golden tone to them that I couldn’t figure out how to get rid of! I’ll leave you with a look at the view outside of the window above the sink right now. A Quick And Easy Easter Craft Using Stamps And Dropcloth – No Sewing Required! 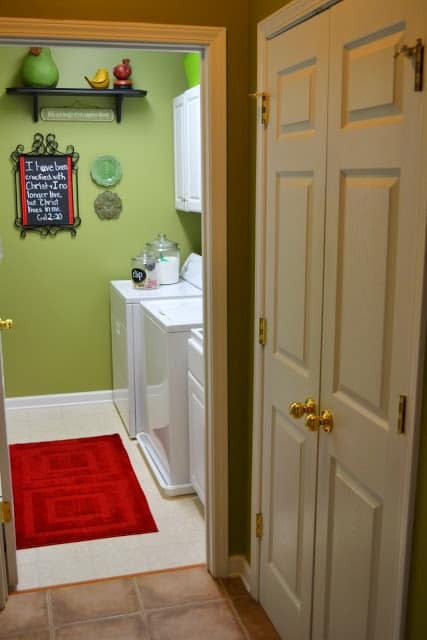 I love your kitchen and you just gave me another idea for my work in progress laundry room. I’m painting it a green color and I haven’t even thought about using red with it! I’m a roo lover too. P.S. I love your countertops!! What a charming kitchen! The colours are so warm and inviting. Your window valance and chandi shades are beautiful. You’ve done a great job drawing the eye away from the finishes in the room. Everything blends perfectly. Have a lovely Monday, Suzy! What a great kitchen! So much color and vibrancy! 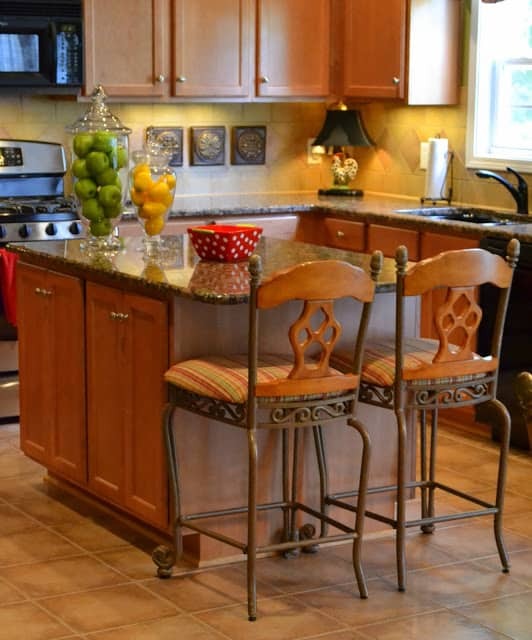 I love all of your vignettes and the warmth the kitchen exudes! You’ve done a beautiful job! I think your kitchen is just lovely, & I really like all the special touches you’ve done. The kitchen window valance, the coordinating chair cushions & sweet little lamp shades are absolutely exactly what I’d expect from you — charming, welcoming & inviting! Have a great week! I visited your blog today – I saw you on ‘Savvy Seasons by Liz.’ You have a beautiful kitchen, and the I love the splashes of red. 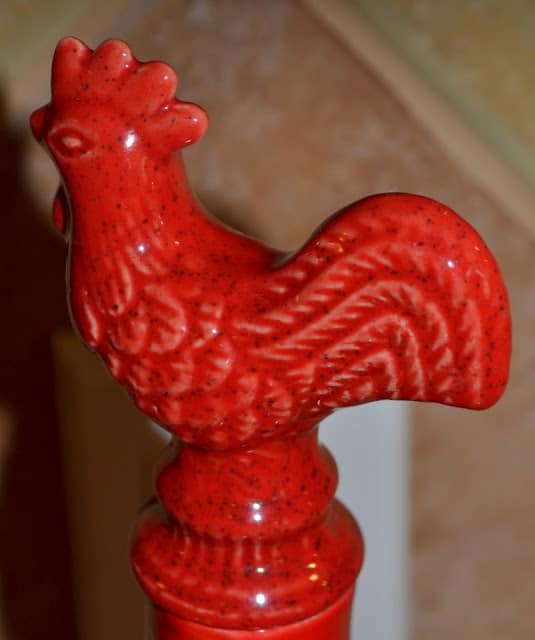 The red roosters are my favorite, as I have a few in my kitchen too. Your photos are so bright and cheerful. Me and my daughters started a new blog, and we would love if if you could visit us and follow. I would enjoy coming back to visit with you and seeing all your decorative ideas. I hope to hear from you, and have a sweet day. is beautiful and you have done an amazing job with the decor. Thanks for stopping by my blog and leaving such a nice comment! I wanted to visit yours too and really love what I see! Your kitchen is so pretty and spacious. Love the color scheme. You are a wonderful drapery maker too. I was so impressed with your valance above your kitchen sink. I also like the shades on your chandelier. There are just so many pretty things to look at. Beautiful kitchen area! 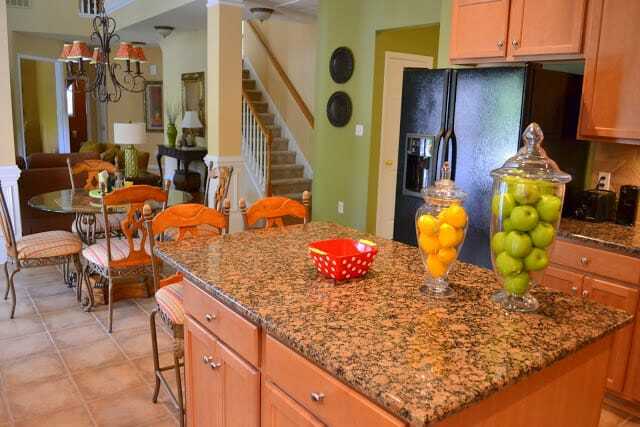 Nice and spacious and I love all your pretty vignettes on the counters. You’ve made it very warm and welcoming. It might not have been “you” to start with but you’ve ended with a lovely kitchen! Charming colorful kitchen. Love all your vignettes and details. 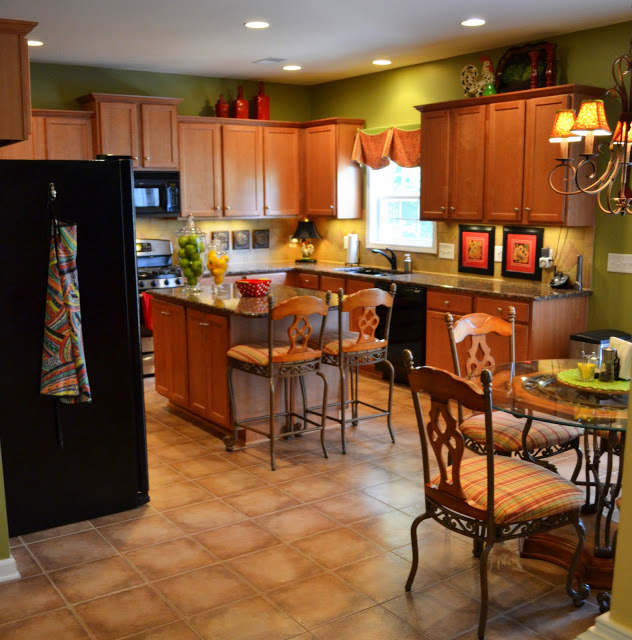 Your kitchen space is incredible…..I love the paint color and all the other touches…I enjoyed the tour! Visiting form C&V, and i have to say i love your kitchen for a couple of reasons. Color – everyone seems to be doing muted greige these days. The right # of accessories – at least to me LOL. 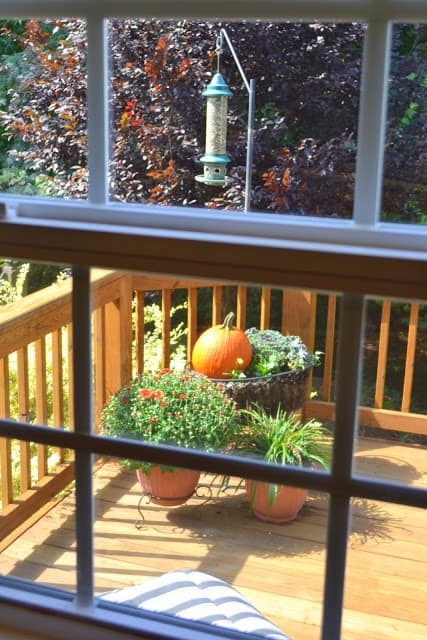 It seems balanced in your space and uncluttered. Lovely and calm. I think it’s a very warm, inviting space. You are lucky to have a kitchen that opens up to the rest of the house. I love the natural light that comes from the window above the sink and the French doors. Thanks so much for joining the Room By Room series today! Your kitchen is lovely. I love all the pops of color. Coming over from Cottage and Vine. Very pretty kitchen. Love the splashes of red, and your curtain is so pretty. I absolutely love your kitchen! It’s bright and cheery and fun! Love the roosters too. I have a few of them myself and am growing to love them, lol! I think you have a lovey kitchen and dining room. I love the green on the walls. 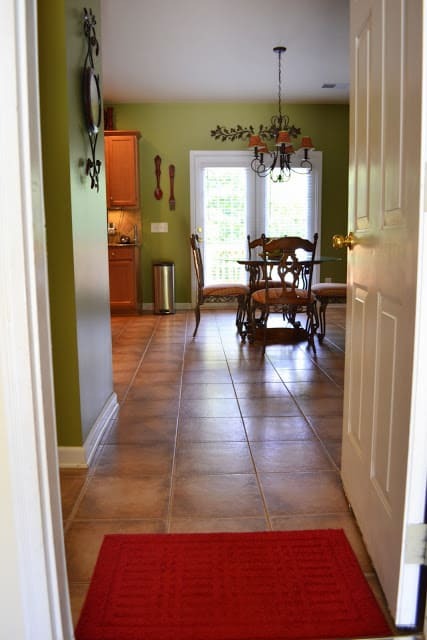 The multi colored roosters above the cabinets are just darling. I enjoyed the tour. Visiting from WOW!! Beautiful kitchen…♥♥♥ the tray with the greens! Red yellow and green… my favorite colors. So homey and welcoming looking. I know you said you did not like your counter tops. I think they are so pretty! 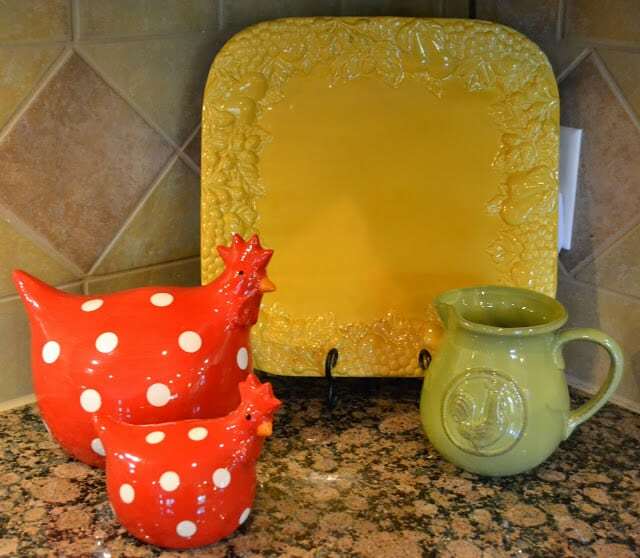 I love your kitchen, of course the rooster theme sold me. I am a rooster fan. I just saw that you linked this up to Motivated Monday and I am so pleased. Your posts are always so terrific. They are well written with great photos and I love your use of color. Your home is beautiful and I love your kitchen! All of the accessories are wonderful and I especially love the Roos. Thank you for linking to the Open House party. A beautiful, cheery space — great job!! I like it!! All of your accessories are awesome!! Thanks for linking up to Show & Share! Owesome decoration…i really loved it..!! Congrats on your feature at Under the table and dreaming! Your kitchen is so bright and beautiful! I took the tour this morning. What a beautiful kitchen. You have wonderful taste. I love all the details! Have a great week Suzy! Just enjoyed the tour of your lovely home. 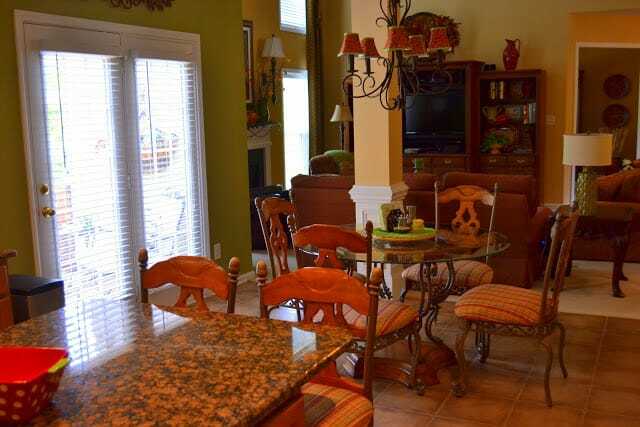 I have a similar color scheme and your decor has me ready to fine tune my kitchen and den area.I also have the same breakfast table and bar stools as your kitchen that I am about to recover in faux leather.Thanks for the inspiration.Great job! Your color palette is my souls color palette. Just wanted to tell you that I have a kitchen I hate – about 1/3 the size of yours, uglier cabinets, same counter tops (or similar). Due to a series of events, including having to remove 3 inches of width from the cabinets next to a new fridge, I painted my cabinets white. I found myself saying over and over again – why did I not do this a LONG time ago???? Think about it……Love your accessories.